"Carlsen" redirects here. For other people named Carlsen, see Carlsen (name). For people with a similar name, see Magnus Carlsson (disambiguation) and Magnus Karlsson (disambiguation). A chess prodigy, Carlsen tied for first place in the World U12 Chess Championship in 2002. Shortly after turning 13, he finished first in the C group of the Corus chess tournament, and earned the grandmaster title a few months later. At age 15, he won the Norwegian Chess Championship, and at 17, he finished joint first in the top group of Corus. He surpassed a rating of 2800 at age 18 and reached number one in the FIDE world rankings aged 19, becoming the youngest person ever to achieve those feats. Carlsen became World Champion in 2013 by defeating Viswanathan Anand. In the following year, he retained his title against Anand, and won both the 2014 World Rapid Championship and World Blitz Championship, thus becoming the first player to simultaneously hold all three titles. He defended his main world title against Sergey Karjakin in 2016, and against Fabiano Caruana in 2018. Known for his attacking style as a teenager, Carlsen has since developed into a universal player. He uses a variety of openings to make it more difficult for opponents to prepare against him and reduce the effect of computer analysis. He has stated the middlegame is his favourite part of the game as it "comes down to pure chess". His positional mastery and endgame prowess have drawn comparisons to those of former World Champions Bobby Fischer, Anatoly Karpov, Vasily Smyslov, and José Raúl Capablanca. Carlsen was born in Tønsberg, Norway, on 30 November 1990, to Sigrun Øen, a chemical engineer, and Henrik Albert Carlsen, an IT consultant. The family spent one year in Espoo, Finland, and then in Brussels, Belgium, before returning to Norway in 1998, where they lived in Lommedalen, Bærum. They later moved to Haslum. Carlsen showed an aptitude for intellectual challenges at a young age: at two years, he could solve 50-piece jigsaw puzzles; at four, he enjoyed assembling Lego sets with instructions intended for children aged 10–14. His father, a keen amateur chess player, taught him to play chess at the age of 5, although he initially showed little interest in the game. He has three sisters, and in 2010 he stated that one of the things that first motivated him to take up chess seriously was the desire to beat his elder sister at the game. The first chess book Carlsen read was Find the Plan by Bent Larsen, and his first book on openings was Eduard Gufeld's The Complete Dragon. Carlsen developed his early chess skills by playing by himself for hours on end—moving the pieces around, searching for combinations, and replaying games and positions shown to him by his father. Simen Agdestein emphasises Carlsen's exceptional memory, stating that he was able to recall the areas, population numbers, flags and capitals of all the countries in the world by the age of five. 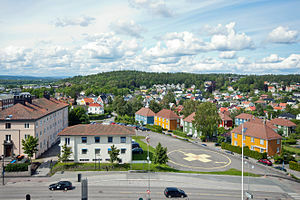 Later, Carlsen had memorised the areas, population numbers, coat-of-arms and administrative centres of "virtually all" Norwegian municipalities. Carlsen participated in his first tournament—the youngest division of the 1999 Norwegian Chess Championship—at the age of 8 years and 7 months, and scored 6½/11. Carlsen was coached at the Norwegian College of Elite Sport by the country's top player, Grandmaster (GM) Simen Agdestein, who in turn cites Norwegian football manager Egil "Drillo" Olsen as a key inspiration for his coaching strategy. In 2000, Agdestein introduced Carlsen to Torbjørn Ringdal Hansen, a former Norwegian junior champion and later International Master (IM) and Grandmaster (GM), as Ringdal served a one-year siviltjeneste (an alternative civilian service programme) at the college. Over the course of this year, Carlsen's rating rose from 904 in June 2000, to 1907. Carlsen's breakthrough occurred in the Norwegian junior teams championship in September 2000, where Carlsen scored 3½/5 against the top junior players of the country, and a performance rating (PR) of about 2000. 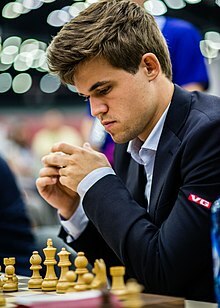 Apart from chess, which he studied about three to four hours a day, Carlsen's favourite pastimes included playing football and reading Donald Duck comics. Carlsen also practised skiing until the age of ten. From autumn 2000 to the end of 2002, Carlsen played almost 300 rated tournament games, as well as several blitz tournaments, and participated in other minor events. In October 2002, he placed sixth in the European Under-12 Championship in Peñiscola. In the following month, he tied for first place in the World Under-12 Championship in Heraklio, placing second to Ian Nepomniachtchi on tiebreak. After this, he obtained three IM norms in relatively quick succession; his first was at the January 2003 Gausdal Troll Masters (score 7/10, 2453 PR), the second was at the June 2003 Salongernas IM-tournament in Stockholm (6/9, 2470 PR), and the third and final IM norm was obtained at the July 2003 Politiken Cup in Copenhagen (8/11, 2503 PR). He was officially awarded the IM title on 20 August 2003. After finishing primary school, Carlsen took a year off to participate in international chess tournaments held in Europe during the fall season of 2003, returning to complete secondary education at a sports school. During the year away from school, he placed joint-third in the European Under-14 Championship and ninth in the World Under-14 Championship. This example uses algebraic notation. Carlsen made headlines after his victory in the C group at the 2004 Corus chess tournament in Wijk aan Zee. Carlsen obtained a score of 10½/13, losing just one game (against the highest-rated player of the C group, Duško Pavasovič). As a result of the victory, he earned his first GM norm, and achieved a PR of 2702. Particularly notable was his win over Sipke Ernst in the penultimate round, when Carlsen sacrificed material to give mate in just 29 moves. Carlsen's victory in the C group qualified him to play in the B group in 2005, and it led Lubomir Kavalek, writing for the Washington Post, to give him the title "Mozart of chess". Agdestein said that Carlsen had an excellent memory and played an unusually wide range of openings. Carlsen's prowess caught the attention of Microsoft, which became his sponsor. Carlsen obtained his second GM norm at the Moscow Aeroflot Open in February. On 17 March, in a blitz chess tournament in Reykjavík, Iceland, Carlsen defeated former World Champion Anatoly Karpov. The blitz tournament was a preliminary event leading up to a rapid knockout tournament beginning the next day. In that event, Carlsen was paired with Garry Kasparov, then the top-rated player in the world. Carlsen achieved a draw in their first game but lost the second, and was thus knocked out of the tournament. In the sixth Dubai Open Chess Championship, held 18–28 April, Carlsen obtained his third and final GM norm. This achievement made him the world's youngest GM at the time, as well as the second-youngest GM in history at the time (after Sergey Karjakin, who earned the title at the age of 12 years and 7 months). Carlsen played in the FIDE World Chess Championship, thus becoming the youngest player ever to participate in one, but was knocked out in the first round by Levon Aronian. In July, Carlsen and Berge Østenstad (then the reigning Norwegian champion) tied for first in the Norwegian Chess Championship, each scoring 7/9. A two-game match between them was arranged to decide the title. Both games were drawn, which left Østenstad the champion because he had superior tiebreaks in the tournament. In the Smartfish Chess Masters event at the Drammen International Chess Festival 2004–05, Carlsen defeated Alexei Shirov, then ranked No. 10 in the world, as well as the co-winner of the tournament. In the semi-finals of the Ciudad de León rapid chess tournament in June, Carlsen played a four-game match against Viswanathan Anand, who was ranked No. 2 in the world at the time and had won the 2003 World Rapid Chess Championship. Anand won 3–1. In the Norwegian Chess Championship, Carlsen again finished in shared first place, this time with his mentor Simen Agdestein. A playoff between them was played between 7 and 10 November. This time, Carlsen had the better tiebreaks, but the rule giving the title to the player with better tiebreak scores in the event of a 1–1 draw had been revoked previously. 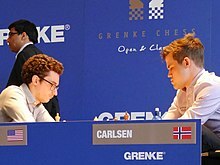 The match was closely fought—Agdestein won the first game, Carlsen the second—so the match went into a series of two-game rapid matches until there was a winner. Carlsen won the first rapid game, Agdestein the second. Then followed three draws until Agdestein won the championship title with a victory in the sixth rapid game. In October, he took first place at the Arnold Eikrem Memorial in Gausdal with a score 8/9 and a PR of 2792. 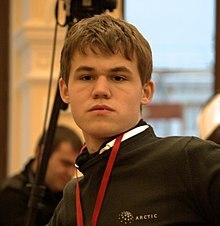 At the end of 2005, Carlsen participated at the Chess World Cup in Khanty-Mansiysk, Russia. In the knockout tournament, he upset the 44th-ranked Zurab Azmaiparashvili in round one, and proceeded to defeat Farrukh Amonatov and Ivan Cheparinov to reach the round of 16. There, Carlsen lost to Evgeny Bareev, but then won against Joël Lautier and Vladimir Malakhov before losing again to Gata Kamsky. Thus, Carlsen finished in tenth place and became the youngest player to be an official World Championship Candidate. 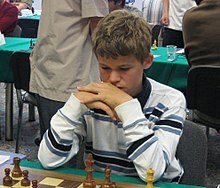 Carlsen qualified for a place in the Corus B group due to his first-place finish in Corus group C in 2004. His shared first place with Alexander Motylev with 9/13 (+6−1=6) qualified him to play in the Corus group A in 2007. At the 2006 international 'Bosna' tournament in Sarajevo, Carlsen shared first place with Liviu-Dieter Nisipeanu (who won on tiebreak evaluation) and Vladimir Malakhov; this could be regarded as Carlsen's first "A" elite tournament win, although it was not a clear first. Carlsen was close to winning the 2006 Norwegian Chess Championship outright, but a last-round loss to Berge Østenstad dropped him into another tie for first place with Agdestein. It also prevented Carlsen from beating Agdestein's record as the youngest Norwegian champion ever. Nonetheless, in the playoff held from 19–21 September, Carlsen won 3–1. After two draws at standard time controls, Carlsen won both rapid games in round two, securing his first Norwegian championship win. Carlsen won the Glitnir Blitz Tournament in Iceland. He achieved a 2–0 win over Viswanathan Anand in the semi-finals and achieved the same score in the finals. He scored 6/8 in the 37th Chess Olympiad and achieved a PR of 2820. In the Midnight Sun Chess Tournament in Tromsø, Carlsen finished second behind Sergei Shipov. In the Biel Grandmaster Tournament, he placed second, beating the tournament winner Alexander Morozevich twice. In the NH Chess Tournament held in Amsterdam in August, Carlsen participated in an "Experience" vs. "Rising Stars" Scheveningen team match. The "Rising Stars" won the match 28–22, with Carlsen achieving the best individual score for the Rising Stars team (6½/10) and a 2700 PR, thus winning the right to participate in the 2007 Melody Amber tournament. With a score of 7½/15, Carlsen placed 8th out of 16 participants at the World Blitz Championship in Rishon LeZion, Israel. In the rapid chess tournament Rencontres nationales et internationales d'échecs in Cap d'Agde, France, he reached the semi-final, losing there to Sergey Karjakin. In November, Carlsen achieved a shared 8th place of 10 participants in the Mikhail Tal Memorial in Moscow with two losses and seven draws. He finished ninth in a group of 18 participants in the associated blitz tournament, which was won by Anand. Playing in the top group of the Corus chess tournament for the first time, Carlsen placed last with nine draws and four losses, scoring 4½/13. In the Linares chess tournament, Carlsen played against top-rated players Veselin Topalov, Viswanathan Anand, Peter Svidler, Alexander Morozevich, Levon Aronian, Peter Leko, and Vassily Ivanchuk. Despite being rated significantly lower than any of them, he finished in second place on tiebreaks with 7½/14, having scored four wins, seven draws and three losses, and achieving a PR of 2778. Carlsen played for the first time in the Melody Amber blind and rapid chess tournament in Monte Carlo in March. In the 11 rounds, he achieved eight draws and three losses in the blindfold games, as well as three wins, seven draws and one loss in the rapid games. This resulted in a shared ninth place in the blindfold, shared second place in the rapid (behind Anand), and a shared eighth place overall. In May and June, he participated in the Candidates Tournament for the FIDE World Chess Championship 2007, facing Levon Aronian in a six-game match at standard time controls, which Carlsen drew (+2−2=2) by coming from behind twice. The four-game rapid playoff was drawn as well (+1−1=2), with Carlsen winning the last game to stay in the match. Eventually, Aronian eliminated Carlsen from the tournament after winning both tiebreak blitz games. In July and August, Carlsen won the Biel Grandmaster Tournament with a 6/10 record and a PR of 2753. His score was matched by Alexander Onischuk and they played a match to break the tie. After drawing two rapid and two blitz games, Carlsen won the armageddon game. Immediately after the Biel tournament, Carlsen entered the open Arctic Chess Challenge in Tromsø, but his fourth-place result with +5=4 was a slight underperformance in terms of rating. In the first round, Carlsen conceded a draw to his classmate Brede Hagen (rated 2034) after having a lost position at one point. A game which attracted some attention was his sixth-round win over his father, Henrik Carlsen. Carlsen reached the semi-final round of the World Chess Cup in December, after defeating Michael Adams in the round of 16 and Ivan Cheparinov in the quarterfinals. In the semi-final, he was eliminated by the eventual winner, Gata Kamsky, scoring ½–1½. In the top group A of the 69th Corus chess tournament, Carlsen scored 8/13, achieving a PR of 2830. Carlsen won five games, lost two and drew six, sharing first place with Levon Aronian. At the Linares chess tournament, Carlsen had another 2800+ PR, scoring 8/14. He finished in sole second place, ½ point behind the winner World Champion Viswanathan Anand. In March, Carlsen played for the second time in the Melody Amber blind and rapid chess tournament, held in Nice for the first time. In the 11 rounds he achieved four wins, four draws and two losses in the blindfold, and three wins, two losses, and six draws in the rapid. This resulted in a shared fifth place in the blindfold, shared third place in the rapid and a shared second place in the overall tournament. Carlsen was one of 21 players in the six-tournament FIDE Grand Prix 2008–2009, a qualifier for the World Chess Championship 2012. In the first tournament, in Baku, Azerbaijan, he finished in a three-way tie for first place, with another 2800 PR. He later withdrew from the Grand Prix cycle despite his initial success, criticising FIDE for "changing the rules dramatically in the middle of a World Championship cycle". Carlsen won a rapid match against Peter Leko held in Miskolc, Hungary, scoring 5–3. In June, Carlsen won the annual Aerosvit chess tournament, finishing undefeated with 8/11 in a category 19 field and achieving a PR of 2877, his best PR at that point in his career. Playing in the category 18 Biel Grandmaster Tournament, Carlsen finished third with 6/10, with a PR of 2740. In the Mainz World Rapid Chess Championship, Carlsen finished in second place after losing the final to defending champion Anand 3–1. In the qualification round Carlsen scored 1½–½ against Judit Polgár, 1–1 against Anand and 1–1 against Alexander Morozevich. In the category 22 Bilbao Masters, Carlsen tied for second with a 2768 PR. Playing in Group A of the 71st Corus chess tournament, Carlsen tied for fifth with a 2739 PR. In the Linares chess tournament, Carlsen finished third with a 2777 PR. Carlsen tied for second place with Veselin Topalov at the M-Tel Masters (category 21) tournament in Sofia, Bulgaria. He lost to eventual winner Alexei Shirov in their final game, dropping him from first. Carlsen won the category 21 Nanjing Pearl Spring tournament, 2½ points ahead of second-place finisher Topalov, the world's highest-rated player at the time. He scored an undefeated 8/10, winning every game as white (against Topalov, Wang Yue, Leko, Teimour Radjabov, and Dmitry Jakovenko), and also winning as black against Jakovenko. By rating performance, this was one of the greatest results in history, with a PR of 3002. Chess statistician Jeff Sonas has declared it one of the 20 best tournament performances of all time, and the best chess performance of all time by a teenager. In the Tal Memorial, played from 5 to 14 November, Carlsen started with seven straight draws, but finished with wins over former FIDE World Champion Ruslan Ponomariov and Peter Leko. This result put Carlsen in shared second place behind former World Champion Vladimir Kramnik and equal with Ivanchuk. After the Tal Memorial, Carlsen won the World Blitz Championship, played from 16 to 18 November in Moscow, Russia. His score of 28 wins, 6 draws and 8 losses left him three points ahead of Anand, who finished in second place. Carlsen entered the London Chess Classic as the top seed in a field including Kramnik, Hikaru Nakamura, Michael Adams, Nigel Short, Ni Hua, Luke McShane and David Howell. He defeated Kramnik in round one and went on to win the tournament with 13/21 (three points were awarded for a win, and one for a draw; using classical scoring he finished with 5/7) and a PR of 2844, one point ahead of Kramnik. This victory propelled him to the top of the FIDE rating list, surpassing Veselin Topalov. Based on his average ranking from the July 2009 and January 2010 FIDE lists, Carlsen qualified for the Candidates Tournament that would determine the challenger to World Champion Viswanathan Anand in the World Chess Championship 2012. In November 2010, however, Carlsen announced he was withdrawing from the Candidates Tournament. Carlsen described the 2008–12 cycle as "[not] sufficiently modern and fair", and wrote that "Reigning champion privileges, the long (five-year) span of the cycle, changes made during the cycle resulting in a new format (Candidates) that no World Champion has had to go through since Kasparov, puzzling ranking criteria as well as the shallow ceaseless match-after-match concept are all less than satisfactory in my opinion." In early 2009 Carlsen engaged former World Champion Garry Kasparov as a personal trainer. In September their partnership was revealed to the public by Norwegian newspapers. Responding to a question in an interview with Time magazine in December 2009 as to whether he used computers when studying chess, Carlsen explained that he does not use a chess set when studying on his own. Carlsen won the 72nd Corus chess tournament played 16–31 January with 8½ points. His ninth-round loss to Kramnik ended a streak of 36 rated games undefeated. Carlsen appeared to struggle in the last round against Fabiano Caruana, but saved a draw, leaving him half a point ahead of Kramnik and Shirov. In March it was announced that Carlsen had split from Kasparov and would no longer use him as a trainer, although this was put into different context by Carlsen himself in an interview with the German magazine Der Spiegel, in which he stated that they would remain in contact and he would continue to attend training sessions with Kasparov. In 2011, Carlsen said: "Thanks to [Kasparov] I began to understand a whole class of positions better. ... Kasparov gave me a great deal of practical help." In 2012, when asked what he learnt from working with Kasparov, Carlsen answered: "Complex positions. That was the most important thing." Carlsen shared first place alongside Ivanchuk in the Amber blindfold and rapid tournament. Scoring 6½/11 in the blindfold and 8/11 in the rapid, Carlsen accumulated 14½ from a possible 22 points. In May it was revealed that Carlsen had helped Anand prepare for the World Chess Championship 2010 against challenger Veselin Topalov, which Anand won 6½–5½ to retain the title. Carlsen had also helped Anand prepare for the World Chess Championships in 2007 and 2008. Carlsen played in the Bazna Kings Tournament in Romania on 14–25 June. The tournament was a double round robin involving Wang Yue, Boris Gelfand, Ruslan Ponomariov, Teimour Radjabov, and Liviu-Dieter Nisipeanu. He finished with 7½/10 and a 2918 PR, winning the tournament by two points ahead of Radjabov and Gelfand. Carlsen then played in a rapid tournament 28–30 August at the Arctic Securities Chess Stars tournament in Kristiansund, Norway. The field featured World Champion Viswanathan Anand, female world No. 1 Judit Polgár, and Jon Ludvig Hammer. In the preliminary round robin, Carlsen scored 3½/6 to qualify for the final, second behind Anand. In the final, Carlsen defeated Anand 1½–½ to win the championship. Following this event, Carlsen suffered setbacks in his next two tournaments. In the 39th Chess Olympiad from 19 September to 4 October, he scored 4½/8, losing three games, to Baadur Jobava, Michael Adams, and Sanan Sjugirov; these were his first losses with the black pieces in more than a year. His team, Norway, finished 51st out of 149 teams. Carlsen's next tournament was the Grand Slam Masters Final on 9–15 October, which he had qualified for automatically by winning three of the previous year's four Grand Slam chess events (2009 Nanjing Pearl Spring, 2010 Corus, 2010 Bazna Kings). Along with Carlsen, the finals consisted of World Champion Anand and the highest two scorers from the preliminary stage held in Shanghai in September: Kramnik and Shirov. 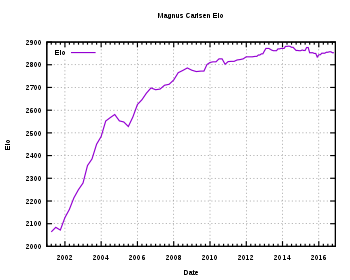 The average Elo of the participants at the time was 2789, making the Grand Slam Final the strongest chess tournament in history. In the first round, Carlsen lost with black to Kramnik; this was Carlsen's second consecutive loss to Kramnik, and placed his hold on the world No. 1 ranking in serious jeopardy. In his second round, Carlsen lost with the white pieces to Anand; this was his first loss as White since January 2010. Carlsen recovered somewhat in the latter part of the tournament, achieving a win over Shirov, and finishing with 2½/6. The tournament was won by Kramnik with 4/6. Carlsen finished this tournament with a rating of 2802, two points behind Anand at 2804 who temporarily ended Carlsen's reign at world No. 1. These setbacks called into question from some whether Carlsen's activities outside chess, such as modelling for G-Star Raw, were distracting him from performing well at the chessboard. Carlsen said he did not believe there was a direct connection. Carlsen's next tournament was the Pearl Spring chess tournament on 19–30 October in Nanjing, China, against Anand, Topalov, Vugar Gashimov, Wang Yue, and Étienne Bacrot. This was the only tournament in 2010 to feature Anand, Carlsen and Topalov, at the time the top three players in the world, and was the first tournament in history to feature three players rated at least 2800. With early wins over Bacrot, Wang Yue, and Topalov with white, Carlsen took the early lead, extending his winning streak with white in Nanjing to eight. This streak was halted by a draw to Anand in round seven, but in the penultimate round Carlsen secured first place by defeating Topalov with black. This was his second victory in the tournament over the former world No. 1; his final score of 7/10 (with a PR of 2903) was a full point ahead of runner-up Anand. On November 5, Carlsen withdrew from the 2011 Candidates Tournament, having qualified as the highest rated challenger, citing dissatisfaction with the World Championship cycle format. In the World Blitz Championship, held in Moscow on 16–18 November, Carlsen attempted to defend his 2009 title. With a score of 23½/38, he finished in third place behind Radjabov and winner Levon Aronian. After the tournament, Carlsen played a private 40-game blitz match against Hikaru Nakamura, winning with a score of 24½–15½. Carlsen won the London Chess Classic on 8–15 December in a field comprising World Champion Anand, Vladimir Kramnik, Nakamura, and British players Adams, Nigel Short, David Howell, and Luke McShane. Carlsen had a rocky start, losing his games to McShane and Anand in rounds 1 and 3, but winning with white against Adams and Nakamura in rounds 2 and 4. He joined the lead with a win over Howell in round 5, and managed to stay in the lead following a harrowing draw against Kramnik in round 6, before defeating Short in the last round. Since the tournament was played with three points for a win, Carlsen's +4−2=1 score put him ahead of Anand and McShane who scored +2=5 (a more traditional two-points-for-a-win system would have yielded a three-way tie, with Carlsen still on top, having the better tiebreaker due to four games with black—Anand and McShane played only three times with black). Carlsen competed in the GM-A group of the 73rd Tata Steel Chess Tournament (formerly called the Corus chess tournament) on 14–30 January in Wijk aan Zee in an attempt to defend his title; the field included World Champion Viswanathan Anand, Levon Aronian, former World Champion Vladimir Kramnik, Alexander Grischuk, Hikaru Nakamura, Ruslan Ponomariov, among others. Despite losing games with white against Anish Giri and reigning Russian champion Ian Nepomniachtchi, Carlsen finished with 8/13, including victories over Kramnik and tournament winner Nakamura. Although Carlsen's performance raised his rating from 2814 to 2815, Anand's 8½/13 score elevated his rating to 2817, making him the world No. 1 for the March 2011 FIDE rating list. The first tournament victory of the year came in the Bazna Kings tournament, a double round robin played in Mediaș, Romania on 11–21 June. Carlsen finished with 6½/10, equal with Sergey Karjakin but with a better tiebreak score. Carlsen won his White games against Nakamura, Nisipeanu, and Ivanchuk and drew the rest of the games. Carlsen won the 44th Biel Grandmaster tournament, held from 16 to 29 July. He took clear first place with a score of 19/30 (+5–1=4; three points for a win) in a field comprising Fabiano Caruana, Maxime Vachier-Lagrave, Alexander Morozevich, Alexey Shirov and Yannick Pelletier, two points ahead of Morozevich. This was Carlsen's second title. The Grand Slam Chess Final was held as a double round robin with six players, in São Paulo (25 September – 1 October) and Bilbao (5–11 October). Although Carlsen had a slow start, including a loss against bottom-ranked Francisco Vallejo Pons, he finished +3−1=6, equal with Ivanchuk (whose +4−3=3 finish was equal due to three points for a win). Carlsen then won the blitz tiebreak against Ivanchuk. The other players were Anand, Aronian, Nakamura, and Vallejo Pons. Another tournament victory was achieved in the Tal Memorial in Moscow 16–25 November as a round robin with ten players. Carlsen won two games, against Gelfand and Nakamura, and drew the rest. Although he finished equal on points with Aronian, he placed ahead since the tiebreak was determined by the number of black games; Carlsen had five black games, while Aronian only had four. In the London Chess Classic, played 3–12 December, Carlsen's streak of tournament victories ended when he finished third, behind Kramnik and Nakamura. Carlsen won three games and drew five. Although he did not win the tournament, Carlsen gained rating points, rising to a new personal record of 2835. 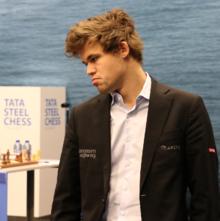 At the 74th Tata Steel Chess Tournament held on 14–29 January in Wijk aan Zee, Carlsen finished in a shared second place with 8/13, behind Aronian, and equal with Radjabov and Caruana. Carlsen defeated Gashimov, Aronian, Gelfand, and Topalov, but lost against Karjakin. At the blitz chess tournament at Tal Memorial, held in Moscow on 7 June, Carlsen shared first place with Morozevich. In the main event (a category 22 ten-player round robin), he won two games and drew seven. He finished in first place, ahead of Radjabov and Caruana. Carlsen then went on to finish second in the Biel Grandmaster Tournament, with 18 points, just one point behind Wang Hao using the 3–1–0 scoring system. As in the Tal Memorial earlier in 2012, Carlsen managed to finish the tournament without any losses (+4−0=6). He also defeated the winner Wang in both of their individual games. In the exhibition blitz tournament at Biel before the GM tournament, Carlsen was eliminated (+1−2=0) in the first round by Étienne Bacrot. Bacrot deprived Carlsen of a win in the classical tournament by holding him to a draw in the final round. Carlsen would have won the classical tournament on the traditional 1–½–0 scoring system, with 7/10. The Grand Slam Chess Final was again held as a double round robin with six players, in São Paulo and Bilbao. Carlsen started with a loss against Caruana, but after three wins in the second (Bilbao) round, finished +4−1=5, equal first with Caruana, and ahead of Aronian, Karjakin and Anand. Carlsen won the tournament by winning both tiebreak games against Caruana. From 24 to 25 November, Carlsen took part in the chess festival "Segunda Gran Fiesta Internacional de Ajedrez" in Mexico City. As part of it, Carlsen took on an online audience (dubbed as "The World") with the white pieces and won. He then took part in the knockout exhibition event "Cuadrangular UNAM". Carlsen first beat Lázaro Bruzón 1½–½, thus qualifying for a final against Judit Polgár (who had in turn beat Manuel León Hoyos 1½–½). Carlsen lost the first game, but won the second one, and in the tiebreak defeated Polgár 2–0. Carlsen won the London Chess Classic in December with five wins (over McShane, Aronian, Gawain Jones, Adams and Judit Polgár) and three draws (against Kramnik, Nakamura and Anand). This win, the third time Carlsen had won the tournament in the past four years, increased his rating from 2848 to a new record of 2861, breaking Kasparov's 13-year record of 2851. By rating performance, this was one of the best results in history, with a PR of 2994. Carlsen played in the 75th Tata Steel Chess Tournament from 11 to 27 January in Wijk aan Zee. In the 13-round tournament, he scored 10 points (+7−0=6), winning clear first 1½ points ahead of second-place finisher Aronian. On 1 February, Danish GM Peter Heine Nielsen joined the team of assistants who helped Carlsen prepare for the Candidates Tournament in March. Before this, Nielsen was on Viswanathan Anand's team. Carlsen played in the 2013 Candidates Tournament, which took place in London, from 15 March to 1 April. He finished with +5−2=7, and won the tournament on tiebreak over Vladimir Kramnik. As a result, he earned the right to challenge Anand for the World Championship. In May, Carlsen played in the first edition of Norway Chess tournament. He finished second, scoring 5½/9 (+3−1=5), half a point behind Sergey Karjakin. Carlsen played in the Tal Memorial from 12 to 23 June. He finished second, with 5½/9, half a point behind Boris Gelfand. Carlsen ended the tournament with +3−1=5, losing to Caruana but beating Anand, Kramnik and Nakamura. Later that month, Carlsen played a four-game friendly rapid match against Borki Predojević, which he won 2½–1½. In the Sinquefield Cup, held in September, Carlsen finished first, scoring 4½/6 (+3−0=3), a point ahead of Nakamura. Carlsen faced Anand in the World Chess Championship 2013, at Hyatt Regency in Chennai, India, from 9 to 22 November. Carlsen won the match 6½–3½ by winning games five, six and nine and drawing the remainder. Thus, Carlsen became the new World Chess Champion. Though Carlsen was the challenger, and less experienced than Anand, he handled the pressure with ease. He drew first blood in game 5 by taking advantage of a small mistake made by Anand, and emerged victorious in games 6 and 9, making him the 16th undisputed World Chess Champion. From 29 January to 4 February, Carlsen played in the Zurich Chess Challenge, winning the blitz event (+2−1=2) and the classical event (+3−0=2). He fared worse in the rapid event (+1−2=2), which counted towards the overall standings, but retained enough of a lead to win the tournament. The other players in the event were Aronian, Nakamura, Caruana, Gelfand and Anand. On 22 March, Carlsen played a game for his club Stavanger in the final team match for promotion to the Norwegian Premier League. His win over Vladimir Georgiev helped his team to a 3½–2½ win over Nordstrand. Carlsen won the Vugar Gashimov Memorial in Şəmkir, Azerbaijan, played from 20–30 April. He played in the A group along with Caruana, Nakamura, Karjakin, Shakhriyar Mamedyarov and Radjabov. Carlsen started the tournament with 2/2, beating Mamedyarov and Nakamura. He then drew against Karjakin, only to lose two games in a row for the first time in four years, losing to Caruana with black and then with white to Radjabov. In the second half of the tournament, Carlsen scored 4/5, beating Mamedyarov and Nakamura again, and securing the tournament victory by beating Caruana in the final round, finishing with +5−2=3. On 8 May, Carlsen played an exhibition game at Oslo City against the people of Norway, assisted by a grandmaster panel consisting of Simen Agdestein, Jon Ludvig Hammer, and Leif Erlend Johannessen. Each of the panel members proposed a move and the public could then vote over the proposed moves. Each panel member was allowed three chances to let chess engine Houdini propose a move during the game. Norway's moves were executed by Oddvar Brå who was disguised in a red spandex suit for the occasion. The game was drawn when Carlsen forced a perpetual check. From 2–13 June, Carlsen played in the second edition of Norway Chess, a ten-man round robin. He placed second with 5½/9, ½ a point behind the winner Karjakin. Other players in the event were Aronian, Caruana, Topalov, Svidler, Kramnik, Grischuk, Giri and Agdestein. Carlsen won the FIDE World Rapid Championship, which was held in Dubai from 16 to 19 June. He went on to claim the World Blitz Championship two days later, becoming the first player to simultaneously hold the title in all three FIDE rated time controls. Carlsen played nine games for Norway in the 41st Chess Olympiad, scoring five wins, two draws, and two losses (against Arkadij Naiditsch and Ivan Šarić). Carlsen placed second to Fabiano Caruana in the Sinquefield Cup, a six-player double round robin held from 27 August to 7 September. Billed as the strongest chess tournament ever held, the remaining 4 players in the event were Levon Aronian, Hikaru Nakamura, Veselin Topalov, and Maxime Vachier-Lagrave. Carlsen lost to Caruana in round 3 and defeated Aronian and Nakamura in rounds 5 and 7, respectively. He finished the tournament with 5½/10 (+2–1=7), three points behind Caruana. Carlsen on-stage at the closing ceremony of the 2014 World Chess Championship in Sochi, Russia. Vishy Anand and Vladimir Putin also pictured. Carlsen faced Anand in a match for the title of World Chess Champion in 2014. Anand qualified by winning the 2014 Candidates Tournament. The rematch was held from 7 to 23 November in Sochi, Russia. After 11 of 12 games, Carlsen led 6½–4½, thereby defending his World Champion title. In January, Carlsen won the 77th Tata Steel Chess Tournament, which was played mainly in Wijk aan Zee on 9–25 January. Carlsen had a poor start to the tournament with two draws and a loss in the third round to Radosław Wojtaszek, which left him in tenth place among the fourteen players. However, a string of six wins in a row thrust Carlsen into clear first place. Drawing the final four games was sufficient to win the tournament with 9 points out of 13, half a point ahead of Anish Giri, Maxime Vachier-Lagrave, Wesley So and Ding Liren. In February, Carlsen won the 3rd Grenke Chess Classic after a five-game tiebreak with Arkadij Naiditsch. Carlsen had finished joint first with Naiditsch on 4½/7, beating Michael Adams, Anand, and David Baramidze, and losing to Naiditsch in their classical encounter. This tournament victory meant that Carlsen began 2015 by winning two out of two tournaments. Carlsen continued his streak in April, winning Shamkir Chess with a score of 7/9 (+5–0=4), defeating Mamedyarov, Caruana, Vachier-Lagrave, Kramnik, and Rauf Mamedov. With a performance rating of 2983, this was Carlsen's third best tournament result ever, behind only Nanjing 2009 (3002 TPR) and London 2012 (2994 TPR). Carlsen had a poor result in the third edition of Norway Chess, held 15–26 June. In the first round he obtained a winning position against Topalov after pressing in a long endgame, only to lose on time when he mistakenly thought that he would receive 15 minutes of extra time at move 60. He was then outplayed by Caruana in the second round, missed a win against Anish Giri in round 3, and lost to Anand in round 4. He won against Grischuk in round 5, drew against Nakamura and Vachier-Lagrave in rounds 6 and 7, and defeated Aronian in round 8, but he lost the last round against Jon Ludvig Hammer, leaving him in seventh place and with a performance rating of 2693. Carlsen said of this result: "It's just extremely frustrating not to be able to show anything close to what I am capable of in my home country." From 22 August to 3 September, Carlsen played in the 2015 Sinquefield Cup. He finished in second place with 5/9 (+3–2=4), one point behind winner Levon Aronian. He defeated the 2014 Sinquefield winner Fabiano Caruana, as well as Maxime Vachier-Lagrave and wild-card Wesley So, but lost to Veselin Topalov and Alexander Grischuk. In October, Carlsen successfully defended his title in the FIDE World Rapid Championships held in Berlin, as the first World Rapid Champion to do so in history, going +8–0=7. He reached the highest live rapid rating in history after the tournament, and was at that point ranked No. 1 in all three disciplines simultaneously. However, Carlsen lost his No. 1 blitz ranking after he had a weak second day in the World Blitz Championship, and was unable to retain his World Blitz Champion title, losing it to Alexander Grischuk. In November, Carlsen participated in the European Team Chess Championship with the Norwegian team. He started off poorly, scoring ½ points out of 3 games, losing to Levon Aronian, drawing against Sune Berg Hansen, and losing again to Yannick Pelletier due to a blunder. However, he finished the tournament strongly, scoring victories against Peter Leko and Radoslaw Wojtaszek, the latter of whom he had lost to earlier in the year, but his performance was not enough to earn his team a medal, and he lost 16 rating points during the event. From 4–13 December, Carlsen participated in the final leg of the Grand Chess Tour, the London Chess Classic. He scored 5½/9 (+2–0=7) in the event, defeating Nakamura (thus inflicting Nakamura's 12th classical loss to Carlsen) and Grischuk, and finished joint first with Anish Giri and Maxime Vachier-Lagrave. In the 3-way tiebreak, Carlsen was the top seed, meaning he faced the winner of the first tie-break match between Giri and Vachier-Lagrave. Carlsen eventually won the tournament by defeating Vachier-Lagrave, which meant he also won the overall Grand Chess Tour. Carlsen then played in the second edition of the Qatar Masters Open, which was held from 20 to 29 December. He finished joint first with 7/9 (+5–0=4), and defeated Yu Yangyi in a tie-break match to win the tournament. From 15 to 31 January, Carlsen participated in the 78th Tata Steel Chess Tournament, held in Wijk Aan Zee. Carlsen won the tournament by scoring 9 points out of 13 (+5–0=8), earning him his 5th Wijk Aan Zee title. From 18 to 30 April, Carlsen played in the fourth edition of the Norway Chess Tournament. He finished in first place with 6/9 (+4–1=4), half a point ahead of Levon Aronian, and a full point in front of Vladimir Kramnik, Veselin Topalov and Maxime Vachier-Lagrave. This was Carlsen's first Norway Chess victory. 11/18 (+7–3=8) to place first overall with a score of 23/36, two and a half points ahead of the runner-up, Wesley So. In July, Carlsen won the 9th edition of the Bilbao Masters Final, scoring 17 points out of 10 games (+4–1=5; a win was 3 points, a draw was 1 point). His only loss was to Hikaru Nakamura, who had never beaten Carlsen in classical chess before. Also during this tournament, Carlsen recorded his first victory over Anish Giri in a classical game. Carlsen played ten games for Norway in the 42nd Chess Olympiad, scoring five wins and five draws, as the Norwegians placed 5th among the 180 teams in the open event. Carlsen also featured in Chess.com's Grandmaster Blitz Battle Championship. Magnus defeated Tigran L. Petrosian 21 to 4 in the first round, and beat Alexander Grischuk 16 to 8 in the semi-final. On 27 October, he faced Nakamura in the final. Playing both blitz and bullet chess for a total of three hours, Carlsen defeated Nakamura 14½ to 10½ and became the first winner of the Chess.com Grandmaster Blitz Battle Championship. From 26 to 30 December, Carlsen played in the World Rapid and Blitz Championships held in Doha, Qatar. He scored 11/15 in the rapid tournament, finishing third on tiebreak behind Ivanchuk and Grischuk. In the blitz tournament, he scored 16½/21, finishing second on tiebreak behind Karjakin, and 2 points clear of the rest of the field. Carlsen faced Sergey Karjakin in the 2016 World Chess Championship in New York City. The 12-game standard match, held between 11 and 28 November, concluded with a 6–6 draw. The match began with seven consecutive draws. Karjakin won game 8 after Carlsen overpressed, but Carlsen equalised the match in game 10. Games 11 and 12 were both drawn. 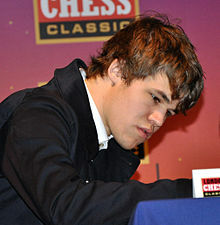 The tiebreaking games were held on 30 November, Carlsen's 26th birthday. After drawing games 1 and 2, Carlsen won games 3 and 4 to record a 3–1 victory and retain his World Champion title. In January, Carlsen participated in the 79th Tata Steel Chess Tournament. He started well, scoring 2 wins and 4 draws in his first 6 games, but missed mate-in-3 versus Giri in round 7, which Giri described as "the most embarrassing moment" of Carlsen's career. Carlsen then lost in round 8 to Richárd Rapport, and ultimately placed second with 8/13 (+4–1=8), one point behind winner Wesley So. From 13 to 22 April, Carlsen competed in the 4th Grenke Chess Classic, finishing in joint second place, though third on tiebreaks, with Fabiano Caruana, with a score of 4/7 (+1–0=6). The clear winner with 5½ points (+4–0=3) was Levon Aronian. As a result, Carlsen's FIDE rating dropped to 2832, his lowest since November 2011 (2826). Carlsen participated in the fifth edition of Norway Chess from 6 to 16 June. He performed poorly and had a performance rating of 2755, his lowest since 2015 (2670, at the European Team Chess Championship). Ultimately, he placed ninth in the round-robin tournament with 4/9 (+1–2=6), losing to Aronian and Kramnik and winning against Karjakin. Aronian won the tournament with 6/9 (+3–0=6). Carlsen played in the Paris leg of the 2017 Grand Chess Tour, which was held from 21 to 25 June. He finished first in the rapid portion of the tournament with 14/18 (+5–0=4; two points for a win) and fifth in the blitz portion with 10/18 (+8–6=4) to place joint first overall with Vachier-Lagrave. Carlsen then defeated Vachier-Lagrave in the playoff to win the tournament. From 28 June to 2 July, he played in the Leuven leg of the Grand Chess Tour. He won this tournament convincingly, scoring 11/18 (+3–1=5; two points for a win) in the rapid portion and 14½/18 (+12–1=5) in the blitz portion for an overall score of 25½/36, three points ahead of the runner-up, Wesley So. Carlsen's performance rating in the blitz portion of the tournament was 3018, which Garry Kasparov described as "phenomenal". Additionally, Leonard Barden, writing for The Guardian, said the performance was only matched by Fischer's 19/22 score at the 1970 World Blitz Championship. From 2 to 11 August, Carlsen competed in the Sinquefield Cup, the first classical event of the Grand Chess Tour. He finished joint second with Anand, scoring 5½/9 (+3–1=5). He recorded three victories (against Karjakin, So and Aronian) and his one loss was to Vachier-Lagrave, who won the tournament with 6/9 (+3–0=6). This result left Carlsen in first place in the Grand Chess Tour standings with 34 points, three points ahead of second place Vachier-Lagrave. In September, he took part in the Chess World Cup 2017. His participation in the event as World Champion was unusual as the World Cup is part of the cycle to challenge the World Champion in 2018. He defeated Oluwafemi Balogun +2–0=0 in the first round to advance to the second round, where he defeated Aleksey Dreev +2–0=0. He was then defeated in the third round by Bu Xiangzhi +0–1=1 and eliminated from the tournament. On 1 October, Carlsen won the Isle of Man Open, a tournament held from 23 September to 1 October. He scored 7½/9 (+6–0=3), half a point ahead of Nakamura and Anand, for a performance rating of 2903. This was Carlsen's first classical tournament victory in 435 days. From 9 to 14 November, Carlsen faced Ding Liren in the 2017 Champions Showdown, a match consisting of 10 rapid and 20 blitz games, hosted by the Saint Louis Chess Club. Carlsen won, scoring 22–8 (+16–2=12). From 1 to 11 December, Carlsen competed in the 2017 London Chess Classic, the final event of the 2017 Grand Chess Tour. He finished fifth, scoring 5/9 (+2–1=6). Caruana shared first place with Nepomniachtchi on 6/9 (+3–0=6) and won the tournament after defeating Nepomniachtchi 2½–1½ in the blitz tiebreak. Carlsen's placing awarded him 7 additional points in the Grand Chess Tour standings, which was enough to crown him the 2017 Grand Chess Tour champion. From 26 to 30 December, Carlsen played in the 2017 World Rapid and World Blitz Chess Championships, held in Riyadh, Saudi Arabia. He finished fifth in the rapid event, scoring 10/15 (+8–3=4). Anand shared first place with Vladimir Fedoseev on 10½/15, and won the tournament after defeating Fedoseev on tiebreak. Carlsen won the blitz event, scoring 16/21 (+13–2=6), one and a half points ahead of his nearest competitors, Karjakin and Anand. This was Carlsen's third World Blitz Chess Championship victory. From October 2017 to January 2018, Carlsen played in the second edition of Chess.com's Speed Chess Championship. He defeated Gadir Guseinov, So and Grischuk in the first three rounds 20½–5½, 27½–9½ and 15½–10½, respectively. On 3 January he defeated Nakamura 18–9 in the final, thus winning the tournament for a second time in a row. From 13 to 28 January, Carlsen competed in the 80th Tata Steel Chess Tournament. He placed joint first with Giri, scoring 9/13 (+5−0=8). Carlsen then defeated Giri 1½–½ in the blitz playoff, thus winning the tournament for a record sixth time. In February, Carlsen won the unofficial Fischer Random Chess Championship, defeating Nakamura by a score of 14–10. Carlsen placed second with a score of 5½/9 (+2–0=7) in the 5th Grenke Chess Classic, held from 31 March to 9 April. Caruana won the event with 6½/9 (+4–0=5). Carlsen won the fifth edition of Shamkir Chess, held from 18 to 28 April, finishing clear first with a score of 6/9 (+3–0=6). From 28 May to 7 June, he competed in the sixth edition of Norway Chess, placing second with 4½/8 (+2–1=5), half a point behind winner Caruana. He defeated Caruana and Aronian in rounds 1 and 3, respectively, but lost to So in round 6. Carlsen participated in the 51st Biel Grandmaster tournament, held from 23 July to 1 August. He finished second on 6/10 (+3–1=6), one-and-a-half points behind the winner Mamedyarov. In August, he competed in the 6th Sinquefield Cup. He tied for first with Caruana and Aronian on 5½/9 (+2–0=7), and jointly won the tournament after the trio decided to share the title. Carlsen represented Vålerenga sjakklubb at the 34th European Chess Club Cup in October. He scored 3½/6 (+1–0=5), as his team finished fifth. From 26 to 30 December, Carlsen played in the 2018 World Rapid and World Blitz Chess Championships, held in Saint Petersburg, Russia. He lost three of his first eight games—including both of first two—to significantly lower-rated opponents in the rapid event and despite a strong recovery was unable to attain a medal, placing fifth with 10½/15 (+9–3=3). He defended his blitz title, going unbeaten to finish clear first on a score of 17/21 (+13–0=8). Carlsen faced Fabiano Caruana in the 2018 World Chess Championship in London. The 12-game match, organised by FIDE, was played between 9 and 28 November. All 12 classical time control games were drawn. Carlsen retained his title by defeating Caruana 3–0 in rapid tiebreak games. Carlsen cited the first rapid game as "critical", and said he felt "very calm" after winning it. From 12 to 27 January, Carlsen competed in the 81st Tata Steel Chess Tournament. With a score of 9/13 (+5−0=8), half a point ahead of Giri, he won the tournament for a record-extending seventh time. Carlsen participated in the sixth edition of Shamkir Chess, held from 31 March to 9 April. He took clear first place with 7/9 (+5−0=4), two points ahead of runner-up Ding. Carlsen said at the event's closing ceremony that it was "one of the best tournaments I've ever played, both in terms of performance and also the quality of the games." Carlsen won the Chess Oscars for 2009, 2010, 2011, 2012 and 2013. The Chess Oscar, organised by the Russian chess magazine 64, was awarded to the year's best player according to a worldwide poll of leading chess critics, writers, and journalists, but it was no longer awarded after 2013, as 64 ceased publication. The Norwegian tabloid Verdens Gang (VG) has awarded Carlsen the "Name of the Year" (Årets navn) twice, in 2009 and 2013. VG also named him "Sportsman of the Year" in 2009. Carlsen has also won the Folkets Idrettspris, a people's choice award from the Norwegian newspaper Dagbladet, in 2009 and 2010. In 2011, he was awarded the Peer Gynt Prize, a Norwegian prize awarded annually to "a person or institution that has achieved distinction in society". In 2013, Time magazine named Carlsen one of the 100 most influential people in the world. Carlsen's Elo rating evolution from 2002 to 2016. In the January 2006 FIDE rankings, at the age of 15 years and 32 days, Carlsen attained a 2625 Elo rating, which made him the youngest person to surpass 2600 Elo (the record has since been broken by Wesley So, Wei Yi and John M. Burke). In the July 2007 FIDE rankings, at the age of 16 years and 213 days, Carlsen attained a 2710 Elo rating, which made him the youngest person to surpass 2700 Elo (the record has since been broken by Wei Yi). On 5 September 2008, after winning in round 4 of the Bilbao Masters, Carlsen, aged 17 years and 280 days old, briefly became No. 1 on the unofficial live ratings list. Carlsen's victory in the 2009 Nanjing Pearl tournament raised his FIDE rating to 2801, making him, aged 18 years and 336 days, the youngest player ever to surpass 2800 Elo. The youngest before Carlsen to achieve this feat was Vladimir Kramnik at the age of 25, and up until this point only Kasparov, Topalov, Kramnik, and Anand had achieved a 2800+ rating. The FIDE rankings in January 2010 recorded Carlsen's rating at 2810, which made him No. 1 rated player in the world. This meant that Carlsen became, at the age of 19 years and 32 days, the youngest ever world No. 1, as well as the first player from a Western nation to reach the top of the FIDE rankings since Bobby Fischer in 1971. The March 2010 FIDE rankings showed Carlsen with a new peak rating of 2813, a figure that only Kasparov had bettered at that time. On the January 2013 FIDE rankings, Carlsen reached 2861, thus surpassing Garry Kasparov's 2851 record from July 1999. In the May 2014 rankings, Carlsen achieved an all-time high record of 2882, with a peak of 2889 on the live ratings list achieved on 21 April 2014. As of December 2018[update], Carlsen is also ranked No. 1 in the FIDE rapid and blitz rating lists with Elo ratings of 2903 and 2939, respectively. 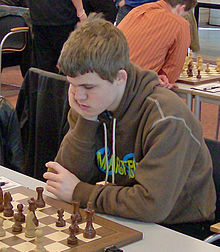 Carlsen had an aggressive style of play as a youth, and, according to Simen Agdestein, his play was characterised by "a fearless readiness to offer material for activity". As he matured, Carlsen found that this risky playing style was not as well suited against the elite of the chess world. When he started playing in top tournaments, he had trouble getting much out of the opening. To progress, Carlsen's style became more universal, capable of handling all sorts of positions well. He opens with both 1.d4 and 1.e4, as well as 1.c4, and, on occasion, 1.Nf3, thus making it harder for opponents to prepare against him and reducing the effect of computer analysis. He said in 2015 that the middlegame is his favourite part of the game as it comes down to "pure chess". In a 2016 interview, Anish Giri said: "Magnus and I are very close in terms of style, but in our approach to the game we're total opposites. Magnus tries to put the accent only on play, getting away from preparation, but for me preparation plays an enormous role." [Carlsen] has been known to say that he isn't all that interested in opening preparation; his main forte is the middlegame, in which he manages to outplay many of his opponents with positional means. ... Carlsen's repertoire is aimed at avoiding an early crisis in the game. He invariably aims for middlegames that lend themselves to a strategic approach. Garry Kasparov, who coached Carlsen from 2009 to 2010, said that Carlsen has a positional style similar to that of past world champions such as Anatoly Karpov, José Raúl Capablanca, and Vasily Smyslov, rather than the tactical style of Alexander Alekhine, Mikhail Tal, and Kasparov himself. In a 2013 interview, Peter Heine Nielsen said: "The days of big novelties are over, and that fits Magnus' style well." According to Carlsen, however, he does not have any preferences in playing style. Kasparov said in 2013 that "Carlsen is a combination of Karpov [and] Fischer. He gets his positions [and] then never lets go of that bulldog bite. Exhausting for opponents." Carlsen has also stated that he follows in the traditions of Karpov and Fischer, but additionally mentions Reuben Fine as a player who "was doing in chess similar to what I am doing". Anand said of Carlsen in 2012: "Magnus has an incredible innate sense. ... The majority of ideas occur to him absolutely naturally. He's also very flexible, he knows all the structures and he can play almost any position." He also compared Carlsen to Boris Spassky in his prime, and stated that "Magnus can literally do almost everything." Kasparov expressed similar sentiments: "[Carlsen] has the ability to correctly evaluate any position, which only Karpov could boast of before him." When asked in a 2016 interview whether Carlsen's style resembles his own, Karpov answered: "It is quite possible. He grew up when I was in power, and perhaps he studied my games. He can convert a minimal advantage into a real one." In a 2012 interview, Vladimir Kramnik stated that Carlsen's "excellent physical shape" was a contributing factor to his success against other top players as it prevents "psychological lapses", which enables him to maintain a high standard of play over long games and at the end of tournaments, when the energy levels of others have dropped. Levon Aronian said in 2015: "Magnus' main secret is his composure and the absence of any soul-searching after mistakes during a game. "Tyler Cowen gave a point of view on Carlsen's playing style: "Carlsen is demonstrating one of his most feared qualities, namely his 'nettlesomeness,' to use a term coined for this purpose by Ken Regan, of the University at Buffalo. Using computer analysis, you can measure which players do the most to cause their opponents to make mistakes. Carlsen has the highest nettlesomeness score by this metric, because his creative moves pressure the other player and open up a lot of room for mistakes. In contrast, a player such as Kramnik plays a high percentage of very accurate moves, and of course he is very strong, but those moves are in some way calmer and they are less likely to induce mistakes in response." ... through the combined force of his skill and no less important his reputation, he drives his opponents into errors. ... He plays on for ever, calmly, methodically and, perhaps most importantly of all, without fear: calculating superbly, with very few outright mistakes and a good proportion of the "very best" moves. This makes him a monster and makes many opponents wilt. An artificial intelligence approach, designed by Jean-Marc Alliot of the Institut de recherche en informatique de Toulouse ("Toulouse Computer Science Research Institute"), which compares chess grandmaster moves against that of Stockfish—a chess engine that outperforms all human opponents—rated Carlsen as the best player of all time as he had the highest probability among all World Chess Champions to play the moves which Stockfish suggested. Carlsen vs. Garry Kasparov, Reykjavík Rapid (2004), Queen's Gambit Declined: Cambridge Springs Defense (D52), ½–½. [games 1] At the age of just 13 years, Carlsen had serious winning chances in a rapid game against Kasparov, who was ranked No. 1 in the world at that time. Carlsen vs. Veselin Topalov, M-Tel Masters (2009), Semi-Slav Defense: General (D43), 1–0. [games 2] This was Carlsen's first win against a 2800+ player. Carlsen vs. Boris Gelfand, Tal Memorial (2011), Slav Defense: Quiet Variation. Schallopp Defense (D12), 1–0. [games 3] The No. 1 Israeli player creates a seemingly decisive rook invasion into White's back rank, but Carlsen vanquishes the threats. Carlsen called it "one of the most interesting games I have played in recent times". Carlsen vs. Hikaru Nakamura, London Chess Classic (2011), Italian Game: Classical Variation. Giuoco Pianissimo (C53), 1–0. [games 4] Facing the No. 1 American player, Carlsen sacrifices the exchange to achieve a winning position in an otherwise near-equal game. Carlsen vs. Viswanathan Anand, Bilbao Masters (2012), Sicilian Defense: Canal Attack. Main Line (B52), 1–0. [games 5] Playing against the then-World Champion, Carlsen sacrifices a pawn to leave Black with a cramped position, which leads to Anand's resignation at move 30. Carlsen stated in 2013 that he considers this game to be one of his best. Carlsen vs. Li Chao, Qatar Masters (2015), Neo-Grünfeld Defence: Goglidze Attack (D70), 1–0. [games 6] Playing against one of the leading Chinese GMs, Carlsen finds a winning attack by sacrificing his queen in a sharp position. Carlsen modelled for G-Star Raw's Fall/Winter 2010 advertising campaign along with American actress Liv Tyler. The campaign was shot by Dutch film director and photographer Anton Corbijn. The campaign was coordinated with the RAW World Chess Challenge in New York, an event where Carlsen played an online team of global chess players who voted on moves suggested by Maxime Vachier-Lagrave, Hikaru Nakamura, and Judit Polgár. Carlsen, playing white, won in 43 moves. In February 2014, he appeared in G-Star Raw's Spring/Summer 2014 campaign along with actress and model Lily Cole. Film director J. J. Abrams offered Carlsen a role in the movie Star Trek Into Darkness as "a chess player from the future", but Carlsen was unable to get a work permit in time for shooting. In 2012, Carlsen was featured in a 60 Minutes segment and appeared as a guest on The Colbert Report. He was also interviewed by Rainn Wilson for SoulPancake in 2013. As of 2012[update], Carlsen is the only active chess professional with a full-time manager; Espen Agdestein, a FIDE Master and brother of Carlsen's former trainer Simen Agdestein, began working as an agent for Carlsen in late 2008. Agdestein's work consisted initially of finding sponsors and negotiating media contacts but, since 2011, he has taken over management tasks formerly performed by Carlsen's father Henrik. According to The New York Times, Carlsen earned US$1.2 million in 2012, the bulk of which was from sponsorships. In October 2013, Carlsen started his majority-owned company, Play Magnus AS. Based in Oslo, Norway, Play Magnus' first product was an iOS app, called Play Magnus, that allows the user to play a chess engine created using a database of thousands of Carlsen's recorded games from the age of 5. Carlsen's goal is to use Play Magnus as a platform to encourage more people to play chess. In August 2013, Carlsen became an ambassador for Nordic Semiconductor, and in November was selected as one of the "sexiest men of 2013" by Cosmopolitan. In a 2008 Q&A session with Nettavisen, Carlsen was asked whether he had autism, and replied "Well, isn't that obvious?" In a December 2013 interview with Verdens Gang, he clarified that the response was a joke and he had meant "obviously not", also stating: "I consider myself to have normal social skills and to be functioning normally." As of 2016, Carlsen identifies as a social democrat and mostly follows a vegetarian diet, as two of his sisters are vegetarians. In 2017, Carlsen made a special guest appearance on The Simpsons, in an episode where Homer's chess history is revealed. ^ "Carlsen vs. Garry Kasparov, Reykjavík Rapid (2004)". Chessgames.com. ^ "Carlsen vs. Veselin Topalov, M-Tel Masters (2009)". Chessgames.com. ^ "Carlsen vs. Boris Gelfand, Tal Memorial (2011)". Chessgames.com. ^ "Carlsen vs. Hikaru Nakamura, London Chess Classic (2011)". Chessgames.com. ^ "Carlsen vs. Viswanathan Anand, Bilbao Masters (2012)". Chessgames.com. ^ "Carlsen vs. Li Chao, Qatar Masters (2015)". Chessgames.com. ^ a b McClain, Dylan Loeb (2008). "Magnus Carlsen, chess prodigy from Norway". The New York Times. Retrieved 4 January 2013. ^ Danielsen, Arne (2010). Mesteren: Magnus Carlsen og sjakkspillet (in Norwegian). Oslo: Cappelen Damm. p. 27. ISBN 978-82-02-33754-4. ^ "Magnus Carlsen, an unlikely chess master". Financial Times. 28 November 2014. ^ Max, D.T. (21 March 2011). "The prince's gambit: A chess star emerges for the post-computer age". The New Yorker. Retrieved 4 January 2013. ^ Davidson, Max (2 December 2010). "My perfect weekend: Magnus Carlsen". The Telegraph. ^ "Just checking". New in Chess (7): 106. 2006. ^ Agdestein, Simen (2014). Hvordan Magnus Carlsen ble verdensmester. Oslo: NKI forlaget. p. 23. ^ Agdestein, Simen (2014). Hvordan Magnus Carlsen ble verdensmester. Oslo: NKI forlaget. p. 14. ^ "FIDE Chess Profile 1501720 Hansen, Torbjorn Ringdal". FIDE. Retrieved 15 September 2016. ^ "European U12 Championship". Italian Chess Federation. Retrieved 1 September 2015. ^ "17° World Championship u12 (boys)". BrasilBase. Retrieved 1 September 2015. ^ "Sulky 'Mozart of chess' the new Kasparov". The Sydney Morning Herald. Retrieved 31 January 2015. ^ "European Youth Championship Boys – U14". Chess-Results. 22 November 2003. Retrieved 5 January 2013. ^ "World Youth Chess Championship 2003 – Boys-14". Chess-Results. Retrieved 1 September 2015. ^ Carlsen, Magnus (2004). "Magnificent Magnus". New in Chess (2): 48–51. ^ Kavalek, Lubomir (23 February 2012). "Mozarts of Chess". Huffpost. Retrieved 6 August 2018. ^ Agdestein, Simen (2006). "On the Road". New in Chess (4): 17–21. ^ Berntsen, Mathias (27 January 2004). "The Mozart of Chess: Mega Magnus in Wijk aan Zee". ChessBase News. Retrieved 3 January 2013. ^ a b "Boy meets Beast in Reykjavik". ChessBase News. 19 March 2004. Retrieved 3 January 2013. ^ "Magnificent Magnus, the world's youngest grandmaster". ChessBase News. 30 April 2004. Retrieved 3 January 2013. ^ "FIDE WCC R1: Youngest and oldest falter". ChessBase News. 20 April 2004. Retrieved 3 January 2013. ^ "Østenstad slo ut Magnus Carlsen i sjakk-NM" (in Norwegian). Aftenposten.com. 5 September 2004. Retrieved 5 February 2013. ^ "Top 100 Players October 2004 – Archive". FIDE. Retrieved 3 January 2013. ^ "Smartfish sensation: Carlsen defeats Shirov". ChessBase News. 4 January 2005. Retrieved 3 January 2013. ^ "World Champion Vishy Anand!". ChessBase News. 2 November 2003. Archived from the original on 17 October 2013. Retrieved 21 August 2013. ^ "Kasimdzhanov and Anand win 3:1, 3:1". ChessBase News. 11 June 2005. Retrieved 3 January 2013. ^ Valaker, Ole (9 November 2005). "Deilig å vinne". Nettavisen (in Norwegian). Retrieved 4 January 2013. ^ Svensen, Tarjei J. (20 October 2005). "14-year-old Carlsen with 2792 performance". ChessBase News. Retrieved 3 January 2013. ^ "Bareev defeats Carlsen, Bacrot KO's Lautier". ChessBase News. 9 December 2005. Retrieved 3 January 2013. ^ "Khanty-Mansiysk: The prodigies are through". ChessBase News. 15 December 2005. Retrieved 3 January 2013. ^ Geuzendam, Dirk Jan ten (2006). "Motylev and Magnus move up". New in Chess (2): 42–49. ^ "Magnus Carlsen: age 15, performance 2700". 19 May 2006. Retrieved 3 June 2014. ^ "Carlsen falters, shares victory with Agdestein". ChessBase News. 16 July 2006. Retrieved 3 January 2013. ^ "Magnus Carlsen, 15, Norwegian Chess Champion". ChessBase News. 21 September 2006. Retrieved 4 January 2013. ^ Nafn. "Skáksamband Íslands – Glitnir blitz 2006". Skaksamband.is. Retrieved 3 January 2010. ^ Nafn. "Skáksamband Íslands – Results". Skaksamband.is. Retrieved 3 January 2010. ^ "37th Chess Olympiad 2006 general. Schachserver der Wiener Zeitung (Austria)". Schach.wienerzeitung.at. Retrieved 3 January 2013. ^ "Shipov wins Midnight Sun, Carlsen second". ChessBase News. 3 July 2006. Retrieved 3 January 2013. ^ "The remarkable Alexander Morozevich wins Biel". ChessBase News. 4 August 2006. Retrieved 3 January 2013. ^ "The NH Chess Tournament". Nhchess.quinsy.net. Archived from the original on 1 September 2009. Retrieved 3 January 2010. ^ Liss, Erik (12 September 2006). "Grischuk wins FIDE World Blitz Championship". ChessBase News. Retrieved 3 January 2013. ^ "Teimour Radjabov wins Cap d'Agde". ChessBase News. 3 November 2006. Retrieved 3 January 2013. ^ "Tal-Mem Blitz: Anand wins with two point lead". ChessBase News. 19 November 2006. Retrieved 3 January 2013. ^ Geuzendam, Dirk Jan ten (2007). "Three cheers for Aronian, Radjabov and Topalov". New in Chess (2): 10–47. ^ "Linares R14: Anand wins Morelia/Linares by a full point". ChessBase News. 10 March 2007. Retrieved 3 January 2013. ^ "Blindfold king Kramnik wins 16th Amber Tournament". ChessBase News. 30 March 2007. Retrieved 4 January 2013. ^ Geuzendam, Dirk Jan ten (2007). "A Whiff of the Golden Age". New in Chess (5): 22–53. ^ "Carlsen: 'This victory is a milestone for my career'". ChessBase News. 5 August 2007. Retrieved 3 January 2013. ^ "Second Arctic Chess Challenge in Tromsø". Chess News. 7 August 2007. Retrieved 5 April 2016. ^ "Brede Hagen vs Magnus Carlsen". Chessgames.com. Retrieved 3 January 2013. ^ "Carlsen vs Carlsen – Magnus beats his dad". ChessBase News. 10 August 2007. Retrieved 3 January 2013. ^ "Khanty-Mansiysk: Gata Kamsky in the Final". ChessBase News. 10 December 2007. Retrieved 3 January 2013. ^ "Wijk R13: Aronian, Carlsen win Wijk aan Zee 2008". ChessBase News. 27 January 2008. Retrieved 3 January 2013. ^ "Linares R14: All games drawn, Anand wins Super-GM". ChessBase News. 7 March 2008. Retrieved 3 January 2013. ^ "Melody Amber: Aronian wins with 2½ point lead". ChessBase News. 27 March 2008. Retrieved 3 January 2013. ^ "Chess News – Magnus Carlsen withdraws from Grand Prix". ChessBase News. Retrieved 3 January 2013. ^ Gyimesi, Zoltán (3 June 2008). "Miskolc: Carlsen wins the rapid chess match 5:3". ChessBase News. Retrieved 3 January 2013. ^ "Aerosvit-2008 official site". Ukrchess.org.ua. 20 June 2008. Retrieved 31 January 2012. ^ "Aerosvit 2008: Carlsen wins by a full point". ChessBase News. 19 June 2008. Retrieved 3 January 2013. ^ Friedel, Frederic (4 August 2008). "Biel 2008: impressions from the final round". ChessBase News. Retrieved 5 February 2013. ^ Fischer, Johannes (4 August 2008). "Mainz 2008: Anand punishes Carlsen in Grenkeleasing final". ChessBase News. Retrieved 3 January 2013. ^ Fischer, Johannes (3 September 2008). "Mainz 2008: Anand to face Carlsen in Grenkeleasing final". ChessBase News. Retrieved 3 January 2013. ^ "Bilbao R10: Topalov wins Bilbao, leads in live rankings". ChessBase News. 16 September 2008. Retrieved 3 January 2013. ^ "Sergey Karjakin wins Wijk aan Zee 2009". ChessBase News. Retrieved 3 January 2013. ^ "Linares R14: All games drawn, Grischuk wins on tiebreak". ChessBase News. 7 March 2009. Retrieved 4 January 2013. ^ McClain, Dylan Loeb (30 May 2009). "Highly Ranked Youth Loses Tactical Battle to an Old Pro". The New York Times. Retrieved 3 January 2013. ^ a b "Nanjing: Carlsen wins Pearl Spring with 3002 performance". ChessBase News. 10 October 2009. Retrieved 3 January 2013. ^ "Chess News – Facts and figures: Magnus Carlsen's performance in Nanjing". ChessBase News. Retrieved 3 January 2013. ^ McClain, Dylan Loeb (15 November 2009). "Kramnik Wins Tal Memorial, Carlsen Claims No. 1 Ranking". New York Times Chess Blog. Retrieved 3 January 2013. ^ McClain, Dylan Loeb (14 November 2009). "Norwegian, 18, Is Youngest to Be Ranked No. 1 at Chess". New York Times Chess Blog. Retrieved 3 January 2013. ^ "World Blitz Championship: Carlsen wins by three-point margin". ChessBase News. 18 November 2009. Retrieved 3 January 2013. ^ "London R7: Carlsen wins Chess Classic". ChessBase News. 16 December 2009. Retrieved 3 January 2013. ^ "Magnus Carlsen drops out of World Championship cycle". ChessBase News. 5 November 2010. Retrieved 3 January 2013. ^ Doggers, Peter (7 September 2009). "Magnus Carlsen: 'My job is to improve my chess'". ChessVibes. Archived from the original on 28 January 2013. Retrieved 3 January 2013. ^ Peterson, Macauley (7 September 2009). "Carlsen, Kasparov Team Up". The Internet Chess Club. Archived from the original on 18 July 2011. Retrieved 30 November 2017. ^ "Breaking news: Carlsen and Kasparov join forces". ChessBase News; translated from the Norwegian newspaper VG Nett. 7 September 2009. Retrieved 3 January 2013. ^ Harrell, Eben (25 December 2009). "Magnus Carlsen: The 19-Year-Old King of Chess". Time. Retrieved 3 January 2013. ^ Valaker, Ole (26 January 2010). "Så tapte Magnus" (in Norwegian). Nettavisen. Retrieved 3 January 2013. ^ Valaker, Ole (31 January 2010). "Magnus vant thrillerfinale" (in Norwegian). Nettavisen. Retrieved 3 January 2013. ^ a b Barden, Leonard (13 March 2010). "World No1 Magnus Carlsen parts company with mentor Garry Kasparov". The Guardian. Retrieved 3 January 2013. ^ "Magnus Carlsen on his chess career". ChessBase News. 15 March 2010. Retrieved 3 January 2013. ^ a b "Magnus Carlsen – 'I don't quite fit into the usual schemes'". ChessBase News. 22 December 2011. Retrieved 9 September 2013. ^ Lubin, Gus (4 September 2012). "An Evening With Magnus Carlsen". Business Insider. Retrieved 9 September 2013. ^ "Amber: Carlsen and Ivanchuk win 19th Amber". ChessBase News. 26 March 2010. Retrieved 3 January 2013. ^ "Chess News – Anand in Playchess – the helpers in Sofia". ChessBase News. 19 May 2010. Retrieved 3 January 2013. ^ Rogozenco, Dorian (25 June 2010). "Medias R10: Magnus Carlsen wins with two-point lead". ChessBase News. Retrieved 3 January 2013. ^ "Arctic Securities Rapid: Carlsen gets "hammered", reaches final". ChessBase News. 29 August 2010. Retrieved 3 January 2013. ^ "Carlsen beats Anand, wins Arctic Securities Rapid". ChessBase News. 31 August 2010. Retrieved 3 January 2013. ^ "Team-Composition for federation NOR – Open". Chess Results. Retrieved 3 January 2013. ^ "Standings; World Chess Olympiad 2010 Khanty-Mansiysk; Всемирная Шахматная Олимпиада Ханты-Мансийск". Ugra-chess. Retrieved 3 January 2013. ^ "Final Chess Masters 2010 in Shanghai and Bilbao". ChessBase News. Retrieved 3 January 2013. ^ "The Week in Chess 827". The Week in Chess. Retrieved 5 April 2016. ^ Valaker, Ole (15 October 2010). "Magnus endte på 3. plass" (in Norwegian). Nettavisen. Retrieved 3 January 2013. ^ Brenne, Øyvind (11 October 2010). "Bekymret for Sjakk-Carlsen etter "ikke-sportslig styr"" (in Norwegian). Verdens Gang. Retrieved 3 January 2013. 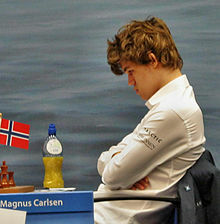 ^ Carlsen, Magnus (16 October 2010). "Magnus Carlsen's Blog". Archived from the original on 20 December 2010. Retrieved 3 January 2013. ^ "Nanjing Super Chess Tournament 2010 (updated)". Previews.chessdom.com. 30 October 2010. Retrieved 3 January 2013. ^ "Nanjing R10: Magnus wins with 2900+ performance". ChessBase News. 30 October 2010. Retrieved 5 January 2013. ^ "Chess News – Magnus Carlsen drops out of World Championship cycle". ChessBase.com. 5 November 2010. Retrieved 9 April 2019. ^ "Aronian wins World Blitz Championship". ChessBase News. 18 November 2010. Retrieved 3 January 2013. ^ Peterson, Macauley (8 December 2010). "Nakamura – Carlsen, Private Blitz Match". United States Chess Federation. Retrieved 16 December 2012. ^ "NIC's Café". New in Chess (1): 6. 2011. ^ Geuzendam, Dirk Jan ten (2011). "London is Carlsen's call". New in Chess (1): 10–29. ^ Geuzendam, Dirk Jan ten (2011). "Class of 2011". New in Chess (2): 11–37. ^ "Top 100 Players March 2011 – Archive". FIDE. Retrieved 3 January 2013. ^ "Media Kings Rd10: Carlsen–Karjakin draw, Carlsen wins Medias 2011". ChessBase News. 21 June 2011. Retrieved 3 January 2013. ^ "Biel Chess Festival 2011 | The Week in Chess". theweekinchess.com. Retrieved 31 January 2019. ^ "Biel Rd.9: Caruana beats Morozevich, Carlsen wins Biel 2011". Chess News. 28 July 2011. Retrieved 31 January 2019. ^ "Bilbao Masters – Carlsen takes first after blitz tiebreak". ChessBase News. 12 October 2011. Retrieved 3 January 2013. ^ "Carlsen catches Aronian in last round, wins Tal Memorial on tiebreak". ChessVibes. 25 November 2011. Archived from the original on 27 March 2014. Retrieved 3 January 2013. ^ "Sjakk-Carlsen har aldri vært bedre" (in Norwegian). Verdens Gang. 12 December 2011. Retrieved 3 January 2013. ^ "Wijk aan Zee Rd13: Aronian is sole winner!". ChessBase News. 29 January 2012. Retrieved 5 February 2013. ^ "Tal Memorial Rd9 – Carlsen takes title in record event". ChessBase News. 19 June 2012. Retrieved 3 January 2013. ^ "45th Biel Chess Festival 2012 – The Week in Chess". The Week in Chess. Retrieved 5 April 2016. ^ "Bilbao Rd10: Carlsen takes title in blitz tiebreak". ChessBase News. 13 October 2012. Retrieved 3 January 2013. ^ "Second Gran Fiesta UNAM with Carlsen and Polgar". ChessBase News. 24 November 2012. Retrieved 26 November 2012. ^ "2nd UNAM won by Magnus Carlsen". ChessBase News. 26 November 2012. Retrieved 3 January 2013. ^ a b c Crowther, Mark (10 December 2012). "Carlsen wins London Chess Classic and takes Kasparov's record". The Week in Chess. Retrieved 3 November 2012. ^ a b "Carlsen beats Kasparov's rating record in London". Chessvibes. 8 December 2012. Archived from the original on 16 January 2013. Retrieved 3 January 2013. ^ "LCC R9: Carlsen first, Kramnik second, both with big wins". ChessBase News. Retrieved 3 January 2013. ^ "Tata R13: Karjakin, Wang score, Carlsen wins Wijk by 1½ points". ChessBase News. 27 January 2013. Retrieved 27 January 2013. ^ "Nielsen switches from Anand to Carlsen". ChessBase News. 31 January 2013. Retrieved 5 February 2013. ^ Ramírez, Alejandro (1 April 2013). "Candidates R14 – leaders lose, Carlsen qualifies". ChessBase News. Retrieved 1 April 2013. ^ "Sergey Karjakin wins Norway Chess 2013". ChessBase News. 18 May 2013. Retrieved 18 May 2013. ^ "Tal Final: Gelfand wins, Carlsen clear second". Chessbase News. 23 June 2013. Retrieved 23 June 2013. ^ Doggers, Peter (29 June 2013). "Carlsen beats Predojevic with (only) 2.5–1.5". ChessVibes. Archived from the original on 2 July 2013. Retrieved 11 July 2013. ^ "Sinquefield 06: Magic Magnus Swindles". ChessBase News. 15 September 2013. Retrieved 16 September 2013. ^ "Chennai G10: Magnus Carlsen is the new World Champion!". ChessBase News. 22 November 2013. Archived from the original on 24 November 2013. Retrieved 22 November 2013. ^ "Zurich Chess Challenge 2014". ChessDom. 19 September 2013. Retrieved 23 January 2014. ^ Aas, Odd Inge; Staveli, Marius (22 March 2014). "Magnus Carlsen sjokkerte med opprykkskamp i norsk 1. divisjon" (in Norwegian). Stavanger Aftenblad. Retrieved 22 March 2014. ^ Ramírez, Alejandro (30 March 2014). "Gashimov R10: From Fool to King". ChessBase. Retrieved 30 March 2014. ^ Bakkehaug, Wegard (8 May 2014). "Carlsen-remis mot Norge: – Dere måtte bruke Houdini for å ha en sjanse" (in Norwegian). VG. Retrieved 8 May 2014. ^ "Norway Chess 2014 – Six Players Announced". ChessDom. 22 January 2014. Retrieved 27 January 2014. ^ "World Rapid: Miraculous Carlsen". Retrieved 20 June 2014. ^ "World Blitz: Triple Crown Achieved!". Retrieved 20 June 2014. ^ "41st Olympiad Tromso 2014 Open". chess-results.com. Retrieved 23 August 2014. ^ Ramirez A (7 September 2014). "Sinquefield 10: Draws end magnificent event". Chessbase News. Retrieved 18 October 2014. ^ Silver, Albert. "Sochi G10: Unrealized opportunities". ChessBase News. Retrieved 22 November 2014. ^ Hystad, Joar; Hansen, Erle Marki (25 January 2015). "Carlsen vant Tata Steel etter remis mot Saric" (in Norwegian). TV2. Retrieved 25 January 2015. ^ Ramirez, Alejandro (10 February 2015). "GRENKE Final: Carlsen wins in Armageddon!". Chessbase News. Retrieved 10 February 2015. ^ McGourty, Colin (28 April 2015). "Shamkir Chess 2015: Winners and losers". Chess24. ^ Ramirez, Alejandro (16 June 2016). "Norway 01: Spectacular Round!". ChessBase. Retrieved 18 June 2015. ^ "Norway Chess 2015". Chessbomb.com. Retrieved 25 June 2015. ^ Pein, Malcolm (26 June 2015). "Hammer blow for Magnus Carlsen as Topalov wins Norway Chess". The Telegraph. ^ Ramirez, Alejandro (2 September 2015). "Sinquefield 09: Aronian wins tournament". ChessBase. ^ "FIDE World Championships 2015". WorldChess.com. Archived from the original on 6 November 2018. Retrieved 12 October 2015. ^ "Chess Live Ratings". 2700chess.com. Retrieved 12 October 2015. ^ Silver, Albert (14 October 2015). "World Blitz 2015: Grischuk wins third title". ChessBase. ^ Silver, Albert (24 November 2015). "ETCC R09: Russia triumphs with double gold". ChessBase. ^ Kavalek, Lubomir (19 December 2015). "Carlsen Wins Grand Chess Tour". ChessBase. ^ Silver, Albert (29 December 2015). "Qatar 2015 Rd9: Carlsen takes title in thrilling final round". ChessBase. ^ Silver A. (31 January 2016). "Tata Steel Rd13: Magnus Carlsen wins fifth title". ChessBase News. Retrieved 31 January 2016. ^ Schulz, André (29 April 2016). "Carlsen wins Norway Chess". ChessBase. ^ Doggers (PeterDoggers), Peter. "Magnus Carlsen Cruises To Victory In Leuven". Chess.com. Retrieved 24 March 2019. ^ "The Week in Chess 1128". theweekinchess.com. Retrieved 24 March 2019. ^ Schulz, André (22 July 2016). "Bilbao, Rd. 9: Carlsen beats Giri and wins tournament". ChessBase. ^ "42nd Olympiad Baku 2016 Open". chess-results.com. Retrieved 15 September 2016. ^ Silver, Albert (28 October 2016). "Carlsen beats Nakamura in 3-hour blitz battle". ChessBase. ^ Doggers, Peter. "Ivanchuk Wins World Rapid Championship". Chess.com. Retrieved 10 October 2017. ^ Doggers, Peter. "Karjakin Wins World Blitz Championship". Chess.com. Retrieved 10 October 2017. ^ McGourty, Colin (22 January 2017). "Tata Steel 2017, 7: Magnus' most embarrassing moment?". Chess24. ^ Ramirez, Alejandro (29 January 2017). "2017 Tata Rd13: Deserved Winner". ChessBase. ^ Moradiabadi, Elshan (23 April 2017). "Grenke Classic 2017: Aronian misses win in exciting finale". ChessBase. ^ Yermolinsky, Alex (16 June 2017). "Levon Aronian wins Norway Chess 2017!". ChessBase. ^ Yermolinsky, Alex (26 June 2017). "Magnus Carlsen wins Grand Chess Tour – Paris in exciting finish". ChessBase. ^ Yermolinsky, Alex (2 July 2017). "Grand Chess Tour – Leuven Express: Magnus Carlsen runs away with event". ChessBase. ^ Barden, Leonard (7 July 2017). "Magnus Carlsen blitzes the field with record-breaking display in Belgium". The Guardian. ^ Staff writer(s) (11 August 2017). "Sinquefield Cup: MVL WINS!". ChessBase. ^ Staff writer(s) (11 August 2017). "2017 Tour Standings". Grand Chess Tour. ^ Doggers, Peter (24 July 2017). "Magnus Carlsen To Play FIDE World Cup". Chess.com. ^ Barden, Leonard (15 September 2017). "Cull of the grandmasters as World Cup quarter-final line-up is completed". The Guardian. ^ Klein, Mike (1 October 2017). "Carlsen Wins 2017 Chess.com Isle of Man International". Chess.com. ^ Barden, Leonard (6 October 2017). "Magnus Carlsen extends gap at top of world rankings with Isle of Man win". The Guardian. ^ "2017 Champions Showdown – Day 6". uschesschamps.com. Retrieved 14 December 2017. ^ "Carlsen vs. Ding Liren – Champions Showdown 2017". chess24.com. Retrieved 14 December 2017. ^ Peterson, Macauley (12 December 2017). "Caruana wins London Classic, but Carlsen takes the Tour". ChessBase. ^ Staff writer(s) (28 December 2017). "FINAL Standings Rapid OPEN". FIDE. ^ Barden, Leonard (29 December 2017). "Veteran Vishy Anand secures surprise title at world rapids in Riyadh". The Guardian. ^ Staff writer(s) (30 December 2017). "Carlsen and Dzagnidze are World Blitz Champions!". FIDE. ^ "2018 Speed Chess Championship Official Schedule, Players, Prizes, Information". chess.com. 3 July 2018. ^ Crowther, Mark (4 January 2018). "Chess.com Speed Chess Championship 2017". The Week in Chess. ^ a b c Barden, Leonard (2 February 2018). "Magnus Carlsen storms back into form with Wijk aan Zee victory". The Guardian. ^ Staff writer(s) (13 February 2018). "Fischer Random 2018". 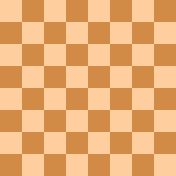 Fischer Random Chess. ^ Doggers, Peter (13 February 2018). "Carlsen Wins Fischer Random Chess Championship". Chess.com. ^ Doggers, Peter (28 April 2018). "Carlsen Wins Shamkir Chess After Quick Draw With Ding". Chess.com. ^ Doggers, Peter (1 August 2018). "Carlsen Finishes 2nd Behind Mamedyarov in Biel". Chess.com. ^ Saravanan, Venkatachalam (28 August 2018). "Sinquefield Cup: Three winners (one playoff)!". ChessBase. ^ Doggers, Peter (19 October 2018). "European Chess Club Cup: St Petersburg, Monaco Take Titles". Chess.com. ^ Barden, Leonard (28 December 2018). "Magnus Carlsen pays for poor start as Daniil Dubov wins World Rapid Chess". The Guardian. ^ McGourty, Colin (31 December 2018). "Carlsen & Lagno end 2018 as World Blitz Champions". Chess24. ^ Sean Ingle (28 November 2018). "Magnus Carlsen beats Caruana in tie-breakers to retain World Chess crown". The Guardian. ^ a b c Staff writer(s) (27 January 2019). "Tata Steel Chess - Round 13 Round-up". ChessBase. ^ a b "Carlsen caps stunning Shamkir by beating Grischuk". chess24.com. Retrieved 10 April 2019. ^ "Shamkir, Round 9: Magnus makes it five". Chess News. 9 April 2019. Retrieved 10 April 2019. ^ TPR of FIDE-rated events calculated according to FIDE Title Regulations 1.48 and 1.49. ^ "Standings grandmaster group A 2013". ^ Crowther, Mark (2 April 2013). "The Week in Chess 960". The Week in Chess. Retrieved 12 February 2019. ^ Crowther, Mark (20 May 2013). "Norway Chess Super Tournament 2013". The Week in Chess. ^ Crowther, Mark (26 June 2013). "8th Tal Memorial 2013 (Games and Results)". The Week in Chess. ^ Crowther, Mark (29 June 2013). "Carlsen-Predojevic Rapid and Norwegian Championship 2013 (Games and Results)". The Week in Chess. ^ Crowther, Mark (16 September 2013). "The Week in Chess 984". The Week in Chess. ^ Crowther, Mark (15 November 2013). "FIDE World Chess Championship Anand-Carlsen 2013 (Games and Results)". The Week in Chess. ^ Crowther, Mark (10 February 2014). "The Week in Chess 1005". The Week in Chess. ^ Crowther, Mark (20 March 2014). "The Week in Chess 1009)". The Week in Chess. ^ Crowther, Mark (22 March 2014). "Norwegian Team Championship 2013–14 (Games and Results)". The Week in Chess. ^ Crowther, Mark (5 May 2014). "The Week in Chess 1017". The Week in Chess. ^ Crowther, Mark (16 June 2014). "The Week in Chess 1023". The Week in Chess. ^ Crowther, Mark (23 June 2014). "The Week in Chess 1024". The Week in Chess. ^ "41st Olympiad Tromso 2014 Open". ^ Crowther, Mark (8 September 2014). "The Week in Chess 1035". The Week in Chess. ^ Crowther, Mark (24 November 2014). "The Week in Chess 1046". The Week in Chess. ^ "Standings Tata Steel Masters 2015". ^ Crowther, Mark (9 February 2015). "The Week in Chess 1057". The Week in Chess. ^ Crowther, Mark (27 April 2015). "The Week in Chess 1068". The Week in Chess. ^ Crowther, Mark (29 June 2015). "The Week in Chess 1077". The Week in Chess. ^ Crowther, Mark (7 September 2015). "The Week in Chess 1087". The Week in Chess. ^ Crowther, Mark (19 October 2015). "The Week in Chess 1093". The Week in Chess. ^ "20th European Team Chess Championship 2015 Open". ^ Crowther, Mark (14 December 2015). "The Week in Chess 1101". The Week in Chess. ^ Crowther, Mark (19 December 2015). "The Week in Chess 1104". The Week in Chess. ^ "Standings Tata Steel Masters 2016". ^ Crowther, Mark (2 May 2016). "The Week in Chess 1121". The Week in Chess. ^ Crowther, Mark (5 June 2016). "Grischuk wins the ICC Open Final 2016". The Week in Chess. ^ Crowther, Mark (13 June 2016). "The Week in Chess 1127". The Week in Chess. ^ Crowther, Mark (20 June 2016). "The Week in Chess 1128". The Week in Chess. ^ "Carlsen Routs Petrosian 21–4 in Blitz Battle". 23 June 2016. ^ Crowther, Mark (25 July 2016). "The Week in Chess 1133". The Week in Chess. ^ "Carlsen Doubles Down vs Grischuk, Wins Blitz Battle 16–8". 23 August 2016. ^ "42nd Olympiad Baku 2016 Open". ^ "Carlsen Beats Nakamura To Win GM Blitz Battle Championship". 27 October 2016. ^ Crowther, Mark (5 December 2016). "The Week in Chess 1152". The Week in Chess. ^ Crowther, Mark (2 January 2017). "The Week in Chess 1156". The Week in Chess. ^ "Standings Tata Steel Masters 2017". ^ "2017 PRO Chess League: Standings". 19 December 2016. ^ Crowther, Mark (24 April 2017). "The Week in Chess 1172". The Week in Chess. ^ Crowther, Mark (19 June 2017). "The Week in Chess 1180". The Week in Chess. ^ Crowther, Mark (26 June 2017). "The Week in Chess 1181". The Week in Chess. ^ Crowther, Mark (3 July 2017). "The Week in Chess 1182". The Week in Chess. ^ Crowther, Mark (14 August 2017). "The Week in Chess 1188". The Week in Chess. ^ Crowther, Mark (2 October 2017). "The Week in Chess 1195". The Week in Chess. ^ "Masters – Final Ranking List". ^ "2017 Speed Chess Championship Schedule, Results, Information". 2 May 2017. ^ "2017 CHAMPIONS SHOWDOWN STANDINGS AND RESULTS". ^ Crowther, Mark (11 December 2017). "The Week in Chess 1205". The Week in Chess. ^ Crowther, Mark (1 January 2018). "The Week in Chess 1208". The Week in Chess. ^ Crowther, Mark (14 February 2018). "Fischer Random 2018 (Games and Results)". The Week in Chess. ^ "PRO CHESS LEAGUE". 7 March 2018. ^ Crowther, Mark (9 April 2018). "The Week in Chess 1222". The Week in Chess. ^ Crowther, Mark (30 April 2018). "The Week in Chess 1225". The Week in Chess. ^ Crowther, Mark (11 June 2018). "The Week in Chess 1231". The Week in Chess. ^ Crowther, Mark (1 August 2018). "51st Biel Chess Festival 2018 (Games and Results)". The Week in Chess. ^ Crowther, Mark (17 August 2018). "6th Sinquefield Cup 2018". The Week in Chess. ^ "34th European Club Cup". ^ Crowther, Mark (28 November 2018). "World Chess Championship 2018 (TB)". The Week in Chess. ^ ChessBase staff (28 December 2018). "FIDE World Rapid Champions: Dubov and Ju". ChessBase. Retrieved 28 December 2018. ^ "King Salman World Blitz Championship 2018 Open". chess-results.com. 30 December 2018. Retrieved 30 December 2018. ^ "Chess Oscar winner Carlsen to be tested for doping". ChessBase News. 6 November 2011. Retrieved 16 December 2012. ^ "Carlsen Gets His 4th Chess Oscar: 'I Think It's Well-Deserved'". chess-news.ru. 13 June 2013. Retrieved 13 June 2013. ^ Strøm, Kristian Ole (19 December 2009). ""Sjakkens Mozart" ble årets navn" ["Mozart of Chess" became the name]. Verdens Gang. Retrieved 15 February 2013. ^ Strøm, Kristian Ole (24 December 2009). "Magnus (19) er landets største idrettsstjerne! ...men Carlsen skulle gjerne vært best i verden i fotball" [Magnus (19) is the country's biggest sports star! ... but Carlsen would like to be best in soccer]. Verdens Gang. Retrieved 15 February 2013. ^ Skjervum, Eivind (24 December 2009). "Magnus Carlsen (19) suveren vinner av Folkets Idrettspris" [Magnus Carlsen (19) clear winner of People's Sports Prize]. Dagbladet. Retrieved 15 February 2013. ^ Kvam, Lars Hojem (24 December 2012). "Magnus Carlsen fikk flere stemmer enn de tre neste til sammen" [Magnus Carlsen got more votes than the next three in comparison]. Dagbladet. Retrieved 15 February 2013. ^ "Chess star wins prestigious award". Views and News from Norway. 21 March 2011. Retrieved 16 December 2012. ^ Kasparov, Garry (18 April 2013). "The 2013 TIME 100: Magnus Carlsen". Time. Retrieved 18 April 2013. ^ von Keitz, Michael (12 February 2013). "Carlsen's Conquests – at 22 he has broken all records". ChessBase News. Retrieved 12 February 2013. ^ "Anand tops the July 2007 FIDE ratings". ChessBase News. 3 July 2007. Retrieved 5 January 2013. ^ "Bilbao R4: Topalov topples Anand, Carlsen No. 1 in the world". ChessBase News. 5 September 2008. Retrieved 3 January 2013. ^ "Live Rating on 5 Sep 2008". Chess.liverating.org. 17 August 2011. Archived from the original on 18 August 2011. Retrieved 30 November 2017. ^ "Dad Carlsen – This has been a dream". Google. Retrieved 31 January 2012. ^ "FIDE ratings: Anand now number one". ChessBase News. 1 November 2010. Retrieved 6 January 2013. ^ "Magnus Carlsen: Individual Calculations January 2010". FIDE. Retrieved 31 January 2012. ^ "Norwegian Carlsen is youngest to top chess rankings". Agence France-Presse. 1 January 2010. Archived from the original on 27 February 2014. Retrieved 16 February 2013. ^ Moskwa, Wojciech (30 December 2009). "Norwegian teenager to be crowned new chess king". Reuters. Retrieved 3 January 2013. ^ Harell, Ebden (11 January 2010). "A Bold Opening for Chess Player Magnus Carlsen". Time. Retrieved 31 January 2012. ^ Staff writer(s) (May 2014). "Rating Progress Chart – Carlsen, Magnus (NOR)". FIDE. ^ Staff writer(s) (21 April 2014). "Highest Ever Rankings". 2700chess.com. ^ Staff writer(s) (December 2018). "Rapid Top 100 Players December 2018". FIDE. ^ Staff writer(s) (December 2018). "Blitz Top 100 Players December 2018". FIDE. ^ Barden, Leonard (28 January 2006). "Chess: Barden on chess | Sport". The Guardian. Retrieved 3 January 2013. ^ Pein, Malcolm. "Dangers of over-optimism". The Daily Telegraph. Retrieved 3 January 2013. ^ a b "Magnus Carlsen: "I Love the Middlegame, Because There You Get Pure Chess"". Chess-News. ^ Grønn, Atle (27 February 2009). "Magnus Carlsens system" (in Norwegian). Dagsavisen. Archived from the original on 16 July 2011. Retrieved 29 November 2010. ^ "Chess Opening Explorer". Chessgames.com. Retrieved 3 January 2013. ^ McGourty, Colin (21 March 2016). "Giri: "Magnus and I are very close in terms of style"". chess24.com. Retrieved 14 December 2017. ^ Timman, Jan (2012). "Is modern-day chess really all about preparation?". New in Chess (5): 98–101. ^ "Kasparov on coaching Carlsen". Chessvibes. 11 September 2009. Archived from the original on 28 January 2013. Retrieved 3 January 2013. ^ Monokroussos, Dennis (27 April 2013). "A Short Interview With Peter Heine Nielsen". The Chess Mind Blog. Retrieved 14 December 2017. ^ Doggers, Peter (31 October 2014). "Anand-Carlsen Match Only a Week Away". Chess.com. Retrieved 21 November 2014. ^ "Anand's WhyChess interview". Chess in Translation. 10 May 2012. Retrieved 2 January 2013. ^ Mishanp (9 January 2011). "Kasparov's verdict on Carlsen's withdrawal". Chessintranslation.com. Retrieved 3 January 2013. ^ "Анатолий Карпов – Игрок с большой буквы!". ReklamaConnect.com (in Russian). 15 April 2016. Retrieved 14 December 2017. ^ Geuzendam, Dirk Jan ten (2012). "Vladimir Kramnik: 'I like playing chess now probably more than ever'". New in Chess (1): 32–41. ^ McGourty, Colin (2 February 2015). "Aronian: "Magnus' main secret is his composure"". Chess24.com. Retrieved 14 December 2017. ^ "Kenneth W. Regan". CSE Department. University at Buffalo, The State University of New York. Retrieved 22 March 2019. ^ Cowen, Tyler (16 November 2013). "Nettlesomeness, and the first half of the Carlsen-Anand match". MarginalRevolution. Retrieved 25 January 2015. ^ "Chess News – CBM training: Carlsen in Capablanca's footsteps". ChessBase News. Retrieved 3 January 2013. ^ "Lubomir Kavalek: Magnus Carlsen Storms New York's Chess Scene". HuffPost. Retrieved 3 January 2013. ^ "Morozevich beats Aronian and Carlsen beats Radjabov in Tal Memorial Round 5 – The Week in Chess". The Week in Chess. Retrieved 5 April 2016. ^ Speelman, Jon (2013). "Carlsen's Endgame Magic". New in Chess (1): 33–41. ^ "When artificial intelligence evaluates chess champions". Science Daily. CNRS. 25 April 2017. ^ "Top 100 Players January 2004 FIDE Top players archive". FIDE. Retrieved 27 May 2013. ^ Geuzendam, Dirk Jan ten (2009). "Alexey Shirov back on board". New in Chess (4): 17. ^ "Tal Memorial Rd2 – Carlsen beats Gelfand". ChessBase. 18 November 2011. Retrieved 5 June 2018. ^ Geuzendam, Dirk Jan ten (2011). "Magnus Carlsen perseveres and prevails in Pashkov House". New in Chess (8): 23. ^ "NIC's Café". New in Chess (1): 7. 2013. ^ "Magnus Carlsen's new career: fashion model!". ChessBase News. 7 July 2010. Retrieved 3 January 2013. ^ "Magnus pounds The World in RAW Chess Challenge". ChessBase News. 12 September 2010. Retrieved 3 January 2013. ^ Doggers, Peter (17 February 2014). "Magnus Carlsen's YouTube Channel And New G-Star Campaign Video". Chess.com. Retrieved 17 February 2014. ^ "Magnus couldn't make it to Star Trek 2". ChessBase News. 11 April 2012. Retrieved 3 January 2012. ^ "Mozart of Chess – Magnus Carlsen on CBS 60 Minutes". ChessBase News. 20 February 2012. Retrieved 8 January 2013. ^ "Magnus Carlsen defeats Stephen Colbert 2–0". ChessBase News. 25 April 2012. Retrieved 8 January 2012. ^ "SoulPancake interview with Magnus Carlsen". ChessBase News. 7 February 2013. Retrieved 7 February 2013. ^ "Agdestein, Espen FIDE Chess Profile". FIDE. Retrieved 10 September 2013. ^ Geuzendam, Dirk Jan ten (2012). "Interview: Managing Magnus". New in Chess (5): 44–48. ^ Lyall, Sarah (8 April 2013). "Shrewd marketing moves for top-ranked chess player". The New York Times. Retrieved 8 April 2013. ^ "World chess champion Magnus Carlsen launches app". The Telegraph. 25 February 2014. Retrieved 13 March 2014. ^ Hartnett, Kevin (19 March 2014). "Playing a young Magnus Carlsen at chess". Boston Globe. ^ "Nordic Semiconductor ASA : Magnus Carlsen, the best player in chess history, becomes an ambassador for Nordic Semiconductor in three-year sponsorship deal..." 4-traders.com. 13 August 2013. Retrieved 17 August 2013. ^ "The sexiest men of 2013". Cosmopolitan. 25 November 2013. ^ a b "VG Interview with Magnus Carlsen". ChessBase News. Retrieved 22 November 2014. ^ Valaker, Ole (14 February 2008). "Sjakkgeniet Magnus Carlsen (17) stilte på nett-treff med glimt i øyet" (in Norwegian). Retrieved 22 November 2014. ^ "Inside the home (and mind) of world chess champion Magnus Carlsen". Financial Times. Retrieved 8 October 2016. ^ Klein, Mike (20 February 2017). "Magnus Carlsen Mentors Homer Simpson". Chess.com. ^ "Magnus – the chess movie". Chess News. 29 March 2016. Retrieved 1 May 2016. Agdestein, Simen (2004). Wonderboy: How Magnus Carlsen Became the Youngest Chess Grandmaster in the World. Interchess. ISBN 978-90-5691-131-7.